Your horse will love living here! Our horses tend to be happy, relaxed and are well maintained. For boarding, we have 8 matted stalls with bars along two sides for your horse to view the activities and 6 additional stalls along the indoor arena. 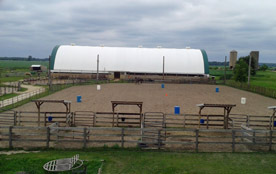 Two additional barns have a total of 8 stalls. You and your horse will have access to the indoor and outdoor arenas and a tack cabinet for your equipment and supplies. 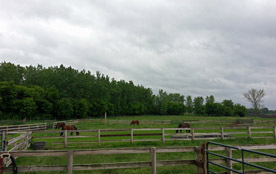 The horses are turned out all day on grass or dirt paddocks—depending on the season and weather conditions. Most often the horses go outside. We use our discretion, and we may turn horses in a bit earlier on colder winter days or extremely bad weather. In the winter, we provide one heated water bucket in the stall and heated paddock tank for each group of horses. Each paddock has a shelter for the horses to get out of the elements and therefore much better equipped to handle Mother Nature. 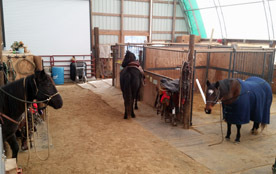 Horses are fed twice a day with a balanced feed and free choice salt in the stalls. A higher fat and highly digestible feed for performance or low weight horses can be fed for an additional cost. We will gladly feed your supplied supplements during the evening feedings. We ask that if there is more than one supplement that you kindly bag them up in individualized packets. Horses are given hay two times a day, unless they are turned out on grass pastures and therefore won’t need the morning hay when the grass is plentiful. Hay cubes are also supplemented as needed. Stalls are cleaned on a daily basis. 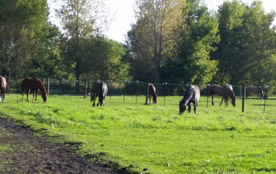 During the summer, most horses are given small paddocks with a shelter for evening rest verses a barn stall to allow them to relax, get out of the heat and move about for their comfort. Our paddock boarding consists of a smaller dirt paddock with a lean to for shelter. 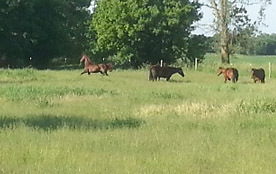 During good weather, most horses are turned out onto grassy pastures during the day and smaller paddock at night. Each horse is grained and given hay twice a day. 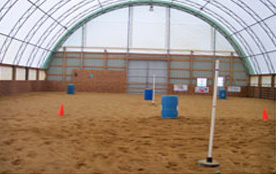 You and your horse will have access to the indoor and outdoor arenas. Each paddock has a water tank that is heated during the winter months. Paddocks are cleaned out on a weekly basis during the summer and as appropriate during the muddy/winter months. Your supplements can also be feed during the evening meals. This is a great option for rehabbing horses or injured horses that need to move about on a limited basis. Call for availability. Limited space is available. Rehab horses are given priority. All boarders are on a rotational worming schedule which is additional to boarding expense. Coggins test are required annually. The Veterinarian pulls blood for Coggins test in the early part of each year. This is an additional cost. The barn requires proof of vaccines and to keep them current each year. We use an equine dentist and a barn farrier. You can use your own farrier or dentist. We strongly recommend when choosing a dentist or farrier that you do your research. We have a barn Veterinarian.